Find out the tantalizing synopsis of the Split sequel! Ever since the runaway success of M. Night Shyamalan's thriller Split (2017), the sequel was inevitable. The movie earned more than $275 million worldwide on a $9 million budget. But, while Split revealed that the movie shared the same universe as the comic book movie Unbreakable we've been left to guess what it would be about. Would it continue the story of Kevin Wendell Crumb AKA The Beast (James McAvoy) and Casey Cooke (Anya Taylor-Joy)? Would the sequel switch focus to Unbreakable and continue the story of David Dunn (Bruce Willis)? Would the movie take the films in a whole new direction? The official synopsis is "Following the conclusion of Split, Glass finds Dunn pursuing Crumb’s superhuman figure of The Beast in a series of escalating encounters, while the shadowy presence of Price emerges as an orchestrator who holds secrets critical to both men." There's not much to read into the upcoming sequel since it states that Dunn chases The Beast. We could have guessed that from Split. But it's cool to learn that Mr. Glass, played by Samuel L. Jackson, is up to his old tricks pulling strings behind-the-scenes even in the penitentiary. Since the movie is named after his character he's obviously playing a huge role in the film. In 2000, M. Night Shyamalan released the movie Unbreakable about a security guard named David Dunn who discovers he has superhuman strength and is impervious to damage. Then, in 2017, he released Split about a man named Kevin Wendell Crumb with 23 different personalities (calling himself "The Horde") who kidnaps and imprisons three teenage girls in an isolated underground facility before revealing the superhumanly strong and fast personality known as "The Beast". 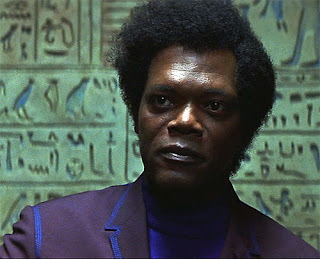 At the end of the film, the final scene shows Dunn watching the news about the Beast and saying the name of his arch-villain "Mr. Glass" played by Samuel L. Jackson. It's a mind-bending twist to a mediocre film in my opinion, but it's popular enough that the sequel is highly anticipated. Even before the sequel was announced Shyamalan admitted he wasn't sure what would go down. "I hope [a third Unbreakable film happens]," he told Entertainment Weekly "The answer is yes. I'm just such a wimp sometimes. I don't know what's going to happen when I go off in my room, a week after this film opens, to write the script. But I'm going to start writing. [I have] a really robust outline, which is pretty intricate. But now the standards for my outlines are higher. I need to know I've won already. I'm almost there but I'm not quite there." A few months later, Universal gave the sequel the green light and he talked about what the ending of Split revealed. "My thought bubble would be - again, don't hold me to this - but Elijah never got out of the institution," Shyamalan later told Slashfilm, "He was just a guy who believed this. But David doesn't quite 100 percent believe it that way. He just thinks that he is particularly meant to do this, and [that belief] is kind of faded a little bit. Like, this idea of comic books, that Elijah was saying the comic book world is based on reality, that it's real---there's no other evidence for this. It's this crazy guy who has this bone disorder who's in an insane asylum. But then [Split] comes up, and he's like, 'Oh my God, he's right.'" The (surviving) cast of Split is confirmed in Bruce Willis as David Dunn, James McAvoy as Kevin Wendell Crumb/The Beast and Anya Taylor-Joy as Casey Cooke the only girl to escape from the Horde. We also know one cast member from Unbreakable is returning in Samuel L. Jackson as Elijah Price/Mr. Glass. It's possible Audrey Dunn (Robin Wright) David's estranged wife and his son Joseph Dunn (Spencer Treat Clark) will return, but it hasn't been announced. The only other actor confirmed is Sarah Paulson who's playing an unnamed character. Paulson is best known right now for playing Marcia Clark in FX’s American Crime Story: The People v. O. J. Simpson. Cast includes Anya Taylor-Joy as Casey Cooke, Bruce Willis as David Dunn, James McAvoy as Kevin Wendell Crumb / The Horde, Samuel L. Jackson as Elijah Price / Mr. Glass, Sarah Paulson as an unnamed cast member. Official Synopsis: Following the conclusion of Split, Glass finds Dunn pursuing Crumb’s superhuman figure of The Beast in a series of escalating encounters, while the shadowy presence of Price emerges as an orchestrator who holds secrets critical to both men. What do you think the synopsis for Glass means? I didn't like Unbreakable much and haven't watched Split so I can't say I'm really excited about it. Not everyone's cup o tea, but I liked the grounding the film gave to the typical comic book story. Not his best work, but number two in my book. Convincing actor Samuel L Jackson, had me believing right up until the end. Huge fan of Shyamalan and Unbreakable, so I'm glad this is happening.